The Vortex-xt is an easy to use torque measuring system ideally suited to making routine quality control measurements where it can be sited right next to the production area. Controlled by a built-in touch-screen console, only minimal training is necessary to begin testing and results are easy to interpret with a colour coded "Pass" or "Fail" indication. 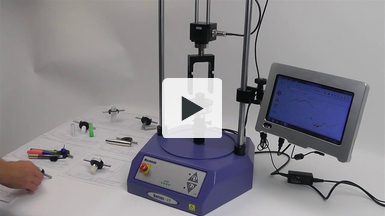 This video is a brief product overview of Mecmesin's touch screen controlled Vortex-xt torque tester. 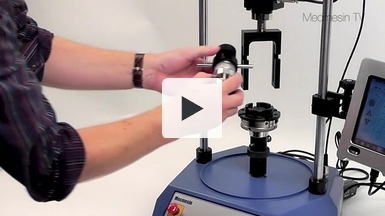 The Vortex-xt is an easy to use torque test system, ideally suited to making routine quality control measurements in production areas. Controlled by a built-in touch-screen console, only minimal training is necessary to begin testing and results are easy to interpret with a colour coded "Pass" or "Fail" indication. The opening and closing torque on lipsticks is tested using a Vortex-i PC-controlled torque testing system. 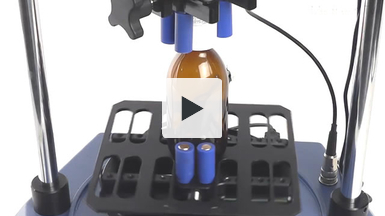 The torque tester is fitted with custom designed adaptors to fit different sizes of lipsticks. 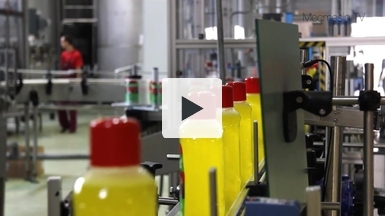 The Vortex-i is driven by Mecmesin's Emperor Torque software, which gives immediate indication of "Pass" or "Fail" for each type and size of lipstick. Results can be seen in real-time and stored for future use. Mecmesin's digital torque testers are use to test the performance of child-resistant closures according to ASTM standards D3198, D3472 and D3810. The motorised Vortex-xt provides a constant test speed for reliable repeatability of testing, eliminating operator bias and protecting against repetitive strain injuries.